Sometimes I forget that I am alive. Life gets busy, I get caught up and before you know it half the day is gone. This might be okay for some, but it catches up with me. I just don’t feel I can afford to not be PRESENT to the day, and more importantly- the moment. That is one of the reasons I love wearing certain pieces of jewelry we make, my all-time favorite 108 count mala is the Golden Crystal Mala. Not only does it look amazing and brings lots of compliments, it brings back my awareness. You pass a mirror, look down searching your desk, you lean forward to grab a pen, and the light catches one of the crystals and suddenly you are back. Oh yeah, my mind was not even with me. Somehow the amber colored crystal Swarovski rondelles, the tiny silk knots, or the crystal end piece will catch my attention enough that I return to becoming aware of myself, my life, my intentions. What good was being off preparing a speech for a future encounter with an employee (that might never happen) or what does “what’s for dinner?” have to do with right now? What did I want today to be like? Most important- what is going on right now, and what am I doing? Am I bringing my full self to the moment? I lived so long reacting to others, buried in the thought of what problem was next. What fire might erupt with my company, my kids, my husband. I never really considered the problem might be I had no appreciation for the present moment, and certainly I had no idea how my thoughts kept me from being present. What started with a small awareness, is now a life mission. What is happening now? Am I aware, listening, present? Am I showing up fully? That is why I ALWAYS wear several outside reminders, gemstone or crystal jewelry pieces, that remind me. And, yes, it works. 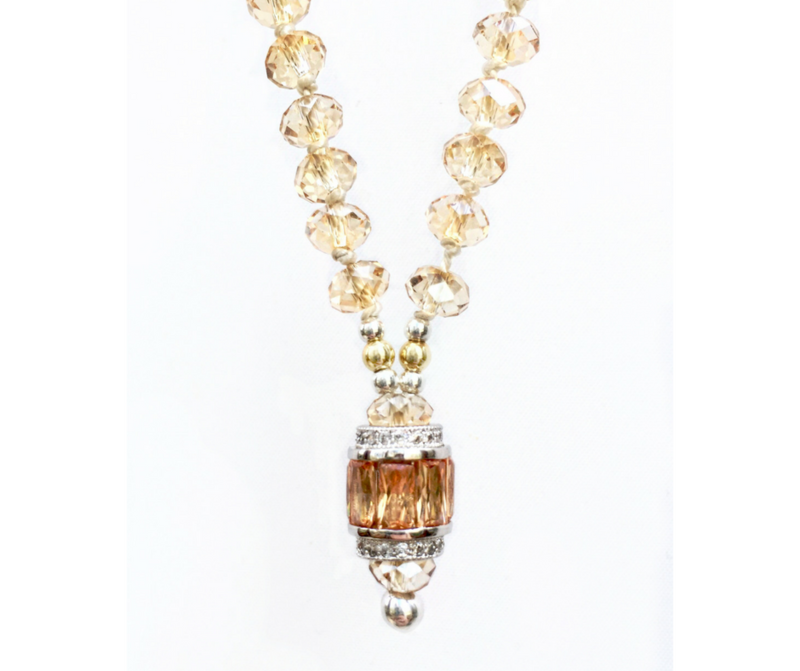 It is not always easy, but it is much easier when you are aware of what you are doing, creating, thinking, or even how you are acting, and the golden crystal mala is easy to wear with everything from an evening gown, to jeans. Mine is well traveled yet the light it throws when I get caught up in useless thoughts seems to show up just when I am in danger losing the preciousness of the day.